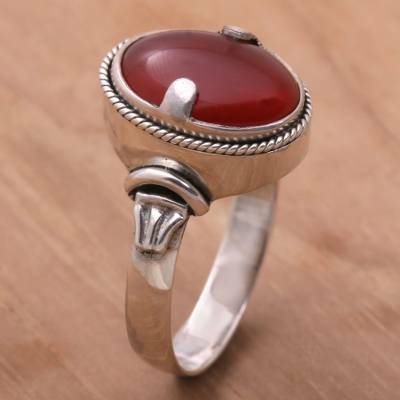 Men's Unique Sterling Silver and Carnelian Ring, "Dragon Eye"
Twin prongs clasp a fiery carnelian in a silver embrace. Bright as a dragon's eye, the gemstone centers a ring by Wayan Sarjana. Carnelian is believed to inspire action, movement, eloquence and courage; it fosters feelings of well-being. "elegant, unique, and gets plenty of compliments"
The stone is a beautiful, warm even shade of orange-red-brown and has a slight translucence that almost gives it a glow. The silver ring is substantial and perfectly crafted in every detail. This has become my favorite ring. Having thick fingers I do purchase Men styled rings for myself. They do look better on my fingers than the smaller Women sized do. This fit snugly, was well made and comfy. I can wear it daily. It will be handed down. It is great alone or with other rings. I am enamored with it. It was nicely crafted and I'm very happy with the quality. "Nice but not what I anticipated..."
This is a very nicely crafted ring and I really like the stone. However I was anticipating a ring that was a little more masculine. It's kind of delicate and feminine, I hope that the designer will one day craft a carnelian ring that's more masculine and I would definitely place an order for one. "A fine piece of jewelry "
A very beautiful ring. Great craftsmanship. Stone and silver both good quality. Very handsome.